Wednesday, December 18th, 2013 . UberConference is in the Cloud Award Finals! UberConference is shortlisted for the second year in the row at The Cloud Awards! This year UberConference is being considered for Most Promising Start-Up and Web Services Excellence. Identifying and celebrating excellence in the field of cloud computing, the cloud computing awards program encourages entries from across the entire globe – the US, Canada, Australasia and EMEA regions. UberConference is proud to be considered a global leader in the telecommunications industry and start-up community. Winners will be chosen and announced on January 28, 2014. We would like to extend the best of luck to all nominated! Tuesday, December 10th, 2013 . 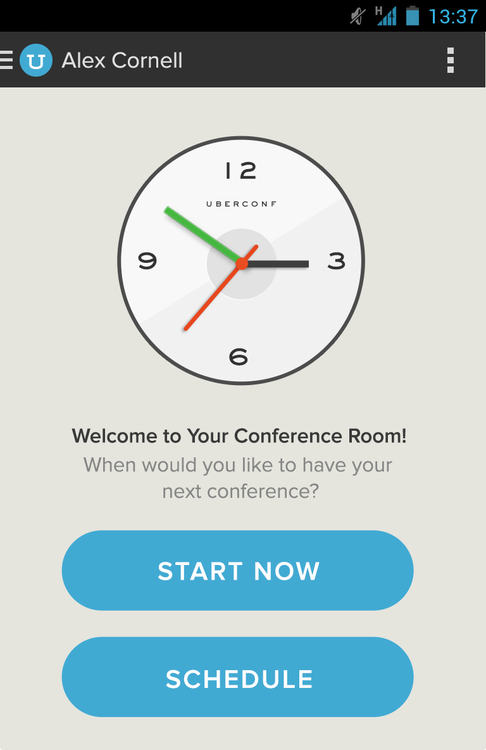 UberConference is proud to deliver a brand new app for Android with the launch of Version 2.0! We’ve added new features to make your meetings more productive than ever. Best of all, our Android app has no PINs if you’re hosting the call, and in our Pro upgrade, there are no PINs for anyone in your conference. Clear and simple. Start a call from your mobile device with no hassle.The Android interface has an all-new design. Open the app, and you’re already in your Conference Room. Your phone contacts are synced to make starting and scheduling calls simple.Our trial-mode has no sign-up and basic service is always free. Simplify your mobile experience now with the Android app for UberConference. 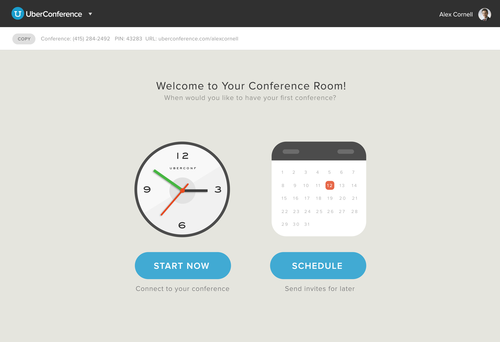 We’re excited to announce a totally redesigned UberConference! Our new interface makes conference calls even easier. Best of all, absolutely no PINs are required for Pro users and their guests. No PINs: For Pro accounts, now there’s no PIN required for anyone in your meeting. For Basic (free) accounts, the meeting organizer dialing-in from their own phone still doesn’t need a PIN. Better security: As always, our visual interface lets you be sure who is and isn’t on your call. No need to worry if someone is still there from your last call or ask “who just joined?” Now you can “lock” and unlock calls whenever you want to prevent others from joining. Simply click the lock icon, or press ## on your phone to lock and unlock. Free New interface: It’s even easier to schedule and host instant calls. Your online conference room is now totally redesigned with many usability improvements. Free call recordings: With this update, even Basic account holders are able to record and share meeting recordings. Mobile apps: Experience our new fully featured Android app(iPhone coming soon). Now easily schedule future conferences in addition to instant conferences while you’re on the go. Tuesday, November 19th, 2013 . 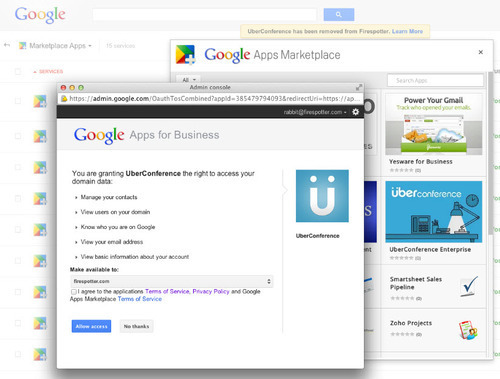 UberConference is now available directly from the Google Apps Admin console which is part of the improvements that were included with the Google Apps Marketplace launch today. In the updated Google Apps Marketplace experience, Google Apps admins can now find and install third-party apps right from their Google Apps Admin console without a separate authentication process. They can also easily manage permissions from the console. UberConference is proud to be in the first batch of apps available directly via the Admin console. This continues a tradition of firsts for UberConference: 1st Chrome Installable apps, 1st HD audio conference service and 1st calling service powered by the new HTML-5 standard WebRTC! Monday, November 18th, 2013 . UberConference was proud to be a host for the second annual OpenCo festival in San Francisco. OpenCo, an innovation themed open house hosted in four major cities, allows community members to get a peek into how local companies are breaking new ground. Craig got a great reception as he shared how our corporate culture fosters creativity. “OpenCo is a great opportunity to showcase how culture, collaboration and hard work play together in building a successful, thriving environment of creative thought and innovation,” said Craig Walker.